My husband doesn't like to be without Glutenza by NuMedica! He can really tell a difference in how he feels when he consistently takes them! Glutenza® - 60 Vegetable Capsules makes a huge difference when I go out to a restaurant as you never know if there are traces of gluten in food. Use when going out to eat in case of accidental gluten exposure so you won't have to deal with inflammation after. Also use for cleaning up past exposure in the gut. Designed to Help Digest Hidden Gluten in Gluten Free Diets! 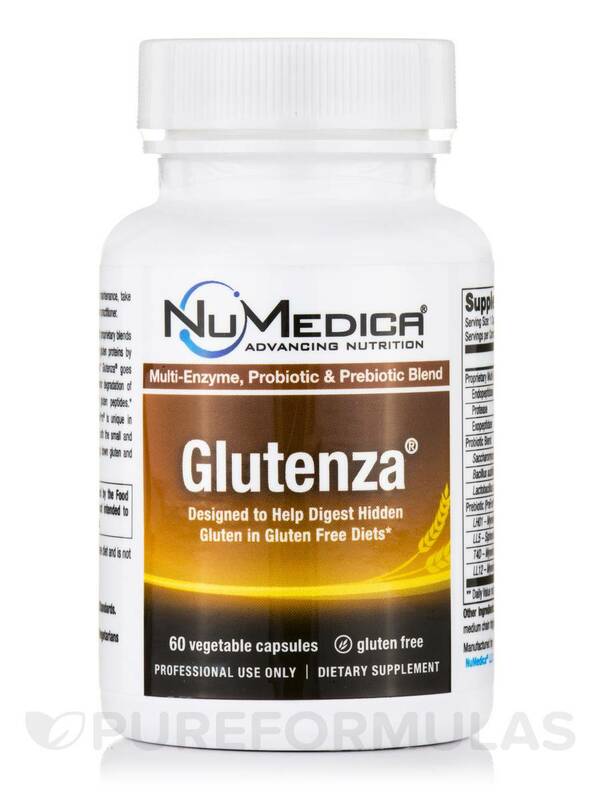 Glutenza® is a powerful formula uniquely designed with proprietary blends of enzymes‚ prebiotics and probiotics to break down gluten proteins by targeting both internal and external peptide bonds. Glutenza® goes beyond the traditional DPPIV enzyme‚ offering superior degradation of gluten proteins by breaking down unhydrolyzed gluten peptides. 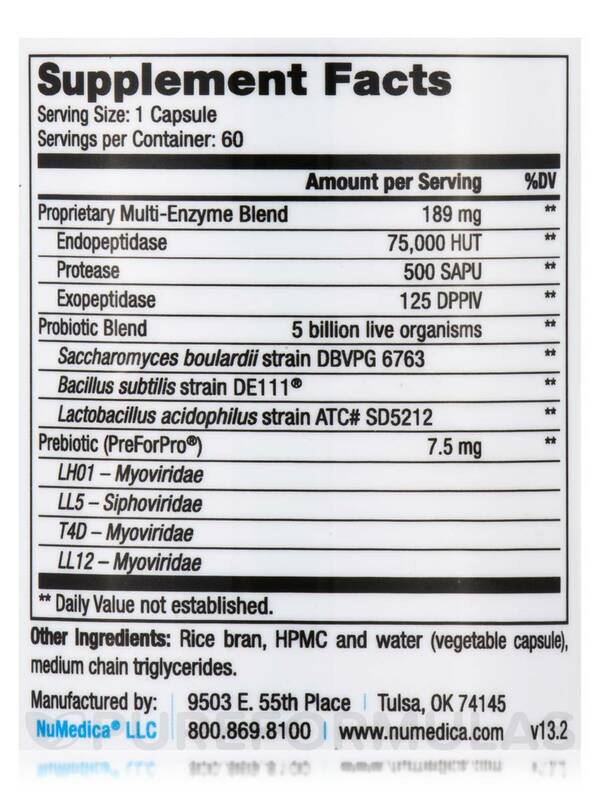 Additionally‚ the highly specialized prebiotic‚ PreForPro® is unique in supporting the proliferation of beneficial bacteria in both the small and large intestines. 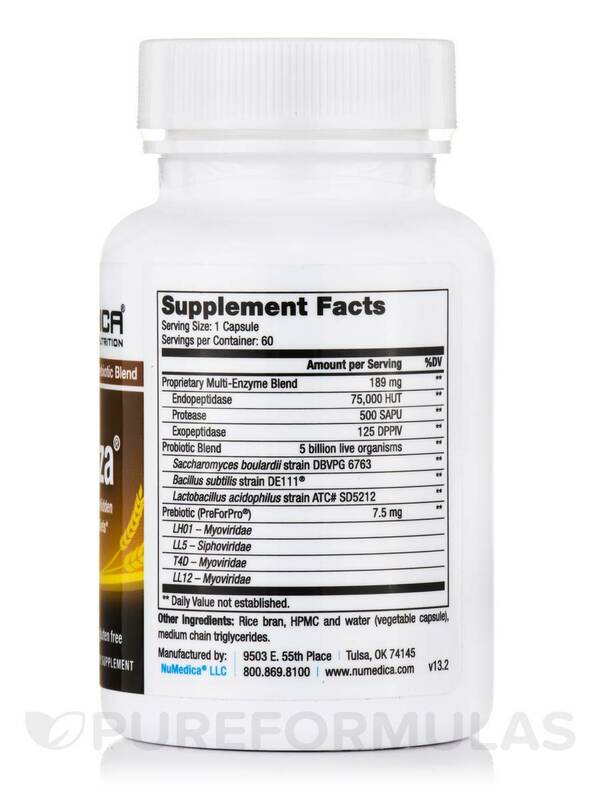 This plays a critical role in breaking down gluten and other proteins to promote a healthy intestinal tract. Other Ingredients: Rice bran‚ HPMC and water (vegetable capsule)‚ medium chain triglycerides. Gluten-Free / Suitable for Vegetarians / This Formula Meets or Exceeds cGMP Quality Standards. Take one capsule before each meal. For maintenance‚ take one capsule twice daily or as directed by your healthcare practitioner. 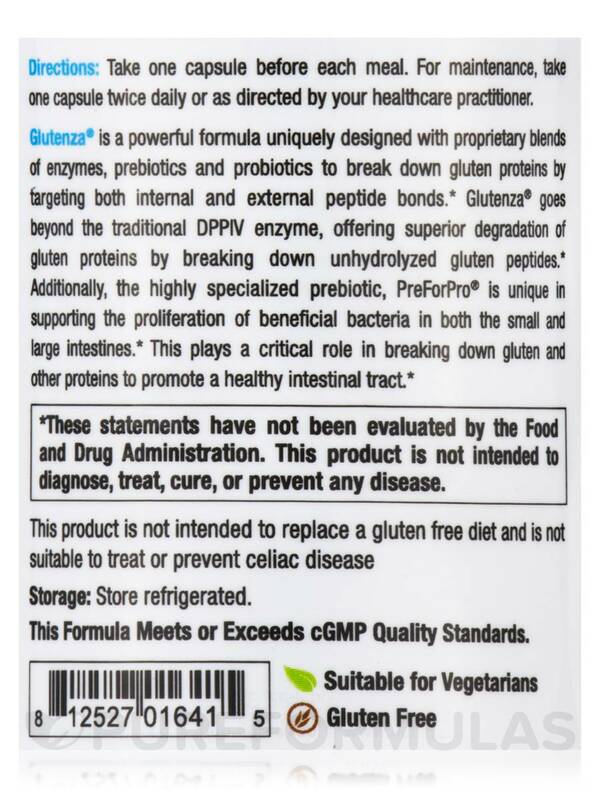 This product is not intended to replace a gluten free diet and is not suitable to treat or prevent celiac disease. Easy to swallow and works really well. Recently learned of my gluten intolerance! 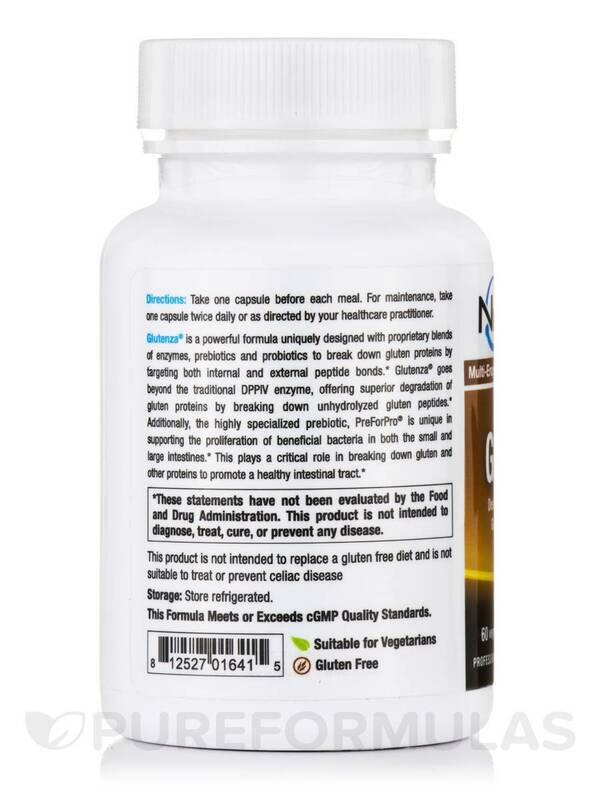 Glutenza by NuMedica was recommended by Dr. Tom O'Bryan. Seems to prevent accidental gluten exposure when eating out; I always take it with me when I eat out from my home. Am no longer having Any symptoms and am feeling great! Cam be part of a Complete Gluten Program with scientific research and references. I have been using Glutenza by NuMedica for a while and am very happy with the results. Every time I get exposed to gluten or over consume dairy products, I feel the negative impact on my body immediately. Glutenza is pretty efficacious at helping reduce these effects. I'm using Glutenza by NuMedica to clean up any residual gluten, seems to be working great! From Numedica, endorsed by Dr Tom O'Bryan.